After these mainly political chapters we can now move ahead with the analysis of economic developments. As a consequence of the electoral campaign and the radicalisation of the political spectrum great expectations were created about the nature of the future economic programme and the identity of the specific group who would carry it out. 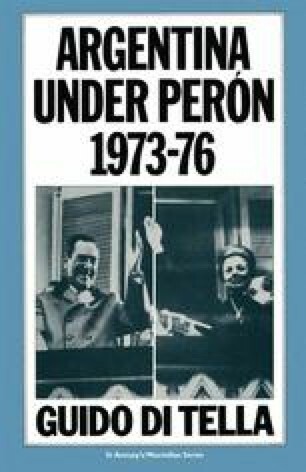 The programme that had been used during the campaign was understandably diffuse, being patterned on the multi-party agreement (the coincidencias programáticas) reached at the end of the previous year (7 December 1972) between the Peronists, the Radicals, the small-business union, the CGE, and the workers’ confederation, the CGT.